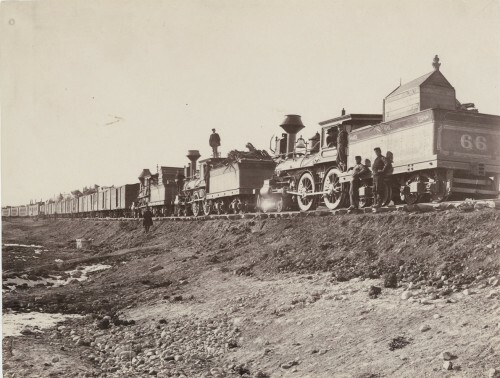 When Grenville Dodge was appointed as Chief Engineer in charge of overseeing the engineering and planning of the transcontinental railroad in 1866, he hired the Casement Brothers as his contractors. Jack Casement was in charge of the actual construction of the transcontinental railroad and his brother Dan oversaw accounting and payroll, occasionally dipping into his own pocket to meet payrolls. A veteran of the Civil War, workers on the railroad referred to Jack Casement as “General Jack.” He led his railroad crew with the same efficiency and toughness that distinguished his army career. However, he faced many frustrations during his tenure, from inclement weather to Native American attacks. Worse yet, Union Pacific leadership was known to be inefficient, which often played a role in halting construction. Learn more about “General Jack” Casement.